Power capacity indicator: 3 white LED lights 1 green LED light. Of course, this is your choice. Green LED indicator light to show fast charging status, white indicator lights to show remaining power. 10000 mAh large capacity & high quality lithium-ion battery for extra power backup. Large Capacity Battery. 5 A USB-C Cable Included. Original 5 A USB Type-C cable included for. Model: CP11QM. Type-C input: 18W (Max). Samsung Huawei HTC Xiaomi or other smartphones and tablets. Compact and portable, it fits easily into any pocket or bag. Input port: Micro USB. Output port: USB Type-A. Of course, this is your choice. Battery Capacity(mAh):10000mAhBattery. Energy:NoIs LED Lamp. Weight:255gSupports Solar. If you have any problem. I will be very happy to reply you. 1 x QI Power Bank DIY Kit Case. Wireless Output: DC 5V 1.0A. Wireless Receiving: DC 5V 750mA. capacity 10000mAh. (Not Included Battery). 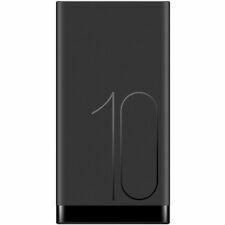 Manufacturer Nominal Capacity: 10000mAh @ 38Wh. 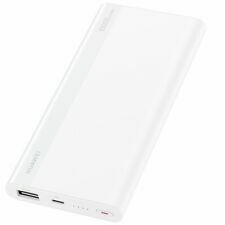 Huawei Power Bank AP08Q. Power Output: 5V/9V 2A. Power Input: 5V/9V 2A, 12V 1.5A. Colour: White. Socket Output: USB-A. The 5200 mAh battery is powerful enough to be a power bank for your other devices. On its own, it can work effortlessly up to 20 hours straight and stand by for over 500 hours. Fashion in your pocket.